by Dr. Hans Baer, Development Studies Program, School of Social and Political Sciences, University of Melbourne. In the drive for profits, global capitalism sacrfices the basic human needs of the majority. Some, a very small percentage, get much more than they need and others do not even get enough to satisfy their minimum needs. There is an enormous disparity is wealth; Oxfam reports that the 62 richest people in the world have as much as the poorest half of the world's population . The existence of poverty and patriarchy stimulates further population growth which entrenches these problems. Global capitalism's requirement for on-going accumulation and growth is environmentally unsustainable, fostering a treadmill of production and consumption that is heavily reliant on fossil fuels, contributing to climate change and resource wars. Climate change is real. According to NASA  and instrument records global surface temperature has rose over a degree since 1880, and fifteen of the sixteen warmest years have occured since 2001 (the exception being 1998), with 2015 the warmest year on record - and 2016 projected to surpass it. Many climate scientists project 4+ degree world by 2100 if greenhouse gas emissions are not quickly diminished. The prevalence of CO2 has increased from 280 ppm at time of Industrial Revolution to 404 ppm in 2016, leading to the a level at the highest point of the last 800,000 years and a rise in other greenhouse gas emissions such as methan, nitrous oxide etc. Recent decades have witnessed retreats of glaciers, a reduction in permanent polar ice cover, and a rise in global sea levels. The result is significant impacts on biodiversity. As a critical anthropologist, I argue that social systems do not last forever, whether on a local, regional, or global scale. As a system capitalism has been around for approximately 500 years and has become the global system. It contains many inherent contradictions, and must be transcended to ensure survival of humanity and animal and plant life. 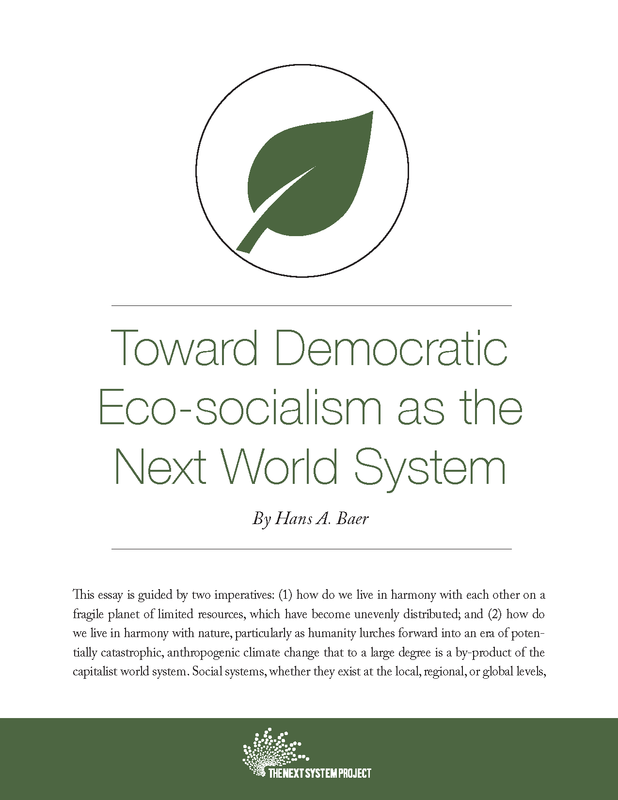 Whilst it is however a well-entrenched system with a great deal of money and power backing it, there is a need for an alternative global system, one that is committed to meeting people's basic needs, providing equity and justice, democracy and sustainability - that is democratic eco-socialism. Over the past forty years Immanuel Wallerstein has been a significant contributor to the research project of world-systems theory, which emphasizes the world-system of global capitalism as the primary focus of study. Capitalism has global market economy. It pays attention to an international division of labour where some 'core' regions of wealth and power (North America, Western Europe, Australia and Japan) differ in their characteristics and capital concentration to the 'semi-periphery' and 'periphery' regions. The current system cannot survive forever . One possible alternative is global fascism or eco-authoritarianism. In many ways it reflects more of the same but with increasing authoritarian control. It is a fortress world mentality, which assumes continued and expanded private ownership and control of environmental resources with meagre resources metered out to the many. The other alternative is global democracy or an eco-socialist world system. According to Wallerstein the end crisis of the present world capitalist system will occur in the next thirty to forty years, but what will replace it remains unclear. Rosa Luxemburg once remarked: »Kein Sozialismus ohne Demokratie, keine Demokratie ohne Sozialismus« ("No socialism without democracy, no democracy without socialism"), which serves as a complement to another of her famous quotes "Bourgeois society stands at the crossroads, either transition to Socialism or regression into Barbarism." With this is mind it is worth considering the two alternatives of capitalist democracy and ‘actually existing socialism’. Capitalist democracy, even in its most advanced liberal form, is a very limited democracy, on that offers the formal choice of representatives every few years. It does not provide economic democracy, and it limits participatory democracy. Noam Chomsky, for example, has described capitalist democracy in the United States as a democracy for the one percent . It is effectively a one party system where different factions of the capitalist class determine their representatives; multinational companies have the global capacity to make or break governments and politicians around the world. With regard to "actually existing socialism", it is clear that the forces of production not fully developed, placing them between a economic transition between capitalism and socialism and often not even as politically advanced. Various political theorists have different interpretations of what these societies constituted. Leon Trotsky referred to the USSR as a "degenerated workers state." Paul Sweezy referred to the USSR as a "post-revolutionary society", and Wallerstein references the "socialist world government" (that is, the government of 'the socialist world'). Others such as Tony Cliff and Charles Bettelheim referred them as "state capitalist". Others, like Milovan Djilas, referred to the collective bureaucracy as a new class society. "An economic system that is democratic, reasonably egalitarian, and able to set limits on consumption will undoubtedly mean that people will live at a significantly lower level of consumption than what is sometimes referred to in a wealthy country as a 'middle class' lifestyle (which has never been universalized even in those societies. A simpler way of life, although 'poorer' in gadgets and ultra-large luxury homes, can be richer culturally and in reconnecting with other people and nature, with people working the shorter hours need to provide life’s essentials. A large number of jobs in the wealthy capitalist countries are non-productive and can be eliminated, indicating that the workweek can be considerably shorter in a more rationally organized economy" (6). Countries with parties in places that are engaging in this challenge include Greece (SYRIZA), France (Nouveau Parti anticapitaliste), Germany (Die Linke) and Holland (Socialist Party) "challenge an economic system in which the interests of ordinary working people are subordinated to those of capital". In the English-speaking world there has been the phenomenon of Jeremy Corbyn and Bernie Sanders phenomenon in UK and US, although we are yet to see such an example in Australia. Transitional reforms for democratic eco-socialism require left parties to capture the State, with support from various anti-systemic movements. In power, corporate carbon and other emissions would be taxed at point of production, and there would be an increasing ownership or socialisation of means of production. A movement toward greater social equality nationally and internationally would occur parallel to building workers' democracy and implementating reforms such as creating meaningful work in a shorter working week, eventually moving towards a net-zero-growth or steady-state economy. As much as possible would be produced locally, avoiding the environmentally destructive effective of fossil fuel-based shipping. Energy itself would be based on renewals, such as solar, wind, thermal, and wave energies, and these would in preference to nuclear, hydroelectric, and biofuels of of which have their own environmental problems. There would be an emphasis on public transportation, and as a result a massively diminishing reliance on private motor vehicles and special licensing required for four-wheeled drives. Cities would need to be redesigned to provide smaller and more energy efficient buildings and dwelling units. Finally, a transitional program would require shifts in food production. With full environmental costs included in the price of foodstuffs there would be a shift towards more consumption of vegetables and grains over meats. Industrial agriculture would be gradually replaced by permaculture and agro-ecology - essentially producing what is sustainable for the land and what is sustainable for the environment to be consumed. These are, of course, very significant changes to the way that we are doing things at the moment. But the way that we are doing things is part of the capitalist world economic system. It is not a sustainable system, and it is a system that is destructive to the health and well-being of members of our own species, of other species, and of the planet itself. Because of this we must change to a world system of democratic eco-socialism. These ideas are further explored in greater detail at The Next System website , and those who wish to engage in the ideas are encouraged to review the documents there. Data source: NASA's Goddard Institute for Space Studies (GISS). Commenting on this Story will be automatically closed on January 26, 2017.